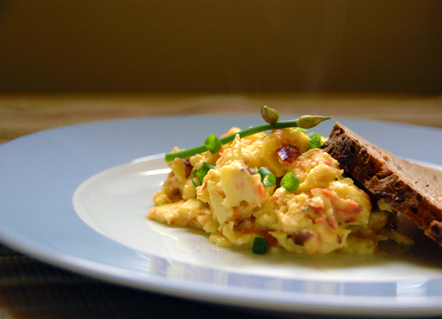 For brunch we had creamy scrambled eggs with my DIY smoked salmon. The bread is a dense German-style rye I picked up at the PSU market from Fressen Artisan Bakery. It's a little bit dryer than the Danish-style rye we like, but still went beautifully with the creamy eggs. While I'm here, I'll remind the other NE PDX'ers (not that they need reminding) that the Hollywood and the King farmers' markets kick off this weekend. I'm going to hit up the King market tomorrow to see what's available. That is, if Mother Nature doesn't decide to pummel us with another hellacious downpour! WC, You're rubbing it in! I'm so jealous. It's not too bad here because the PSU market goes from April until Christmas. I usually go to the markets closer to home and those are from May to October. There is something magical about using smoked salmon you did yourself. It has such a better taste than anything you can buy in the store. Jealous your farmer's market is open. I just got an e-mail that the one by my work will be open in a couple of weeks. Eggs and smoked salmon--such a great combo. Our local farmer's market just opened last week. The growing season is upon us, finally. Yahoo!